Does this mechanic make sense? 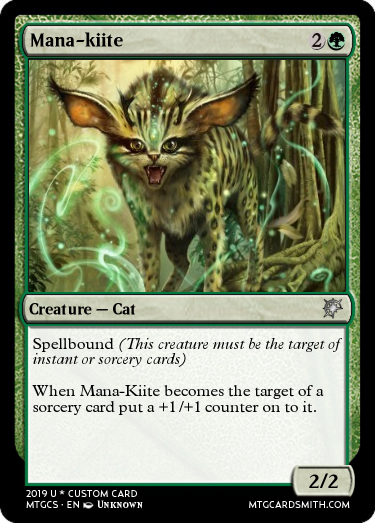 I just designed a card called "Mana-kiite" which uses and effect called "Spellbound" an ability I came up with that I thought might be an interesting one to design around. I was curious if it makes sense or if it could be game breaking? Basically the effect forces you and any enemies to target the creature with spellbound with any sorcery or instant cards that require a target (and can target creatures) I would have to make it so the effect doesn't still work while the card is in the graveyard was my main worry. Potentially game breaking. It is a magnet for all spells, which will both help and hurt you. Could get ugly and quick! Fireball, boom, its dead. Big spell to buff my creature, done. I do not see how it is game breaking. If somebody overlooks it. It also can make the game extremely strange and convoluted, should there be multiple creatures with the effect. Or would that not work with 'X' spells that target multiple things (like Aurelia's Fury or whatever)? I think that works. I only edited Flagbearer's text and didn't think about that idea. But "target" isn't action word in mtg. We can't simplify that part like that unfortunately. And i also realized if it says "permanent", it doesn't need to say "on the battlefield". I think it works with 'X' spells, because it doesn't say "otherwise they can't cast it." It could be interesting, but it should be worded more specifically. Perhaps "Permanents with spellbound must be chosen as targets for spells before permanents without spellbound if able."? Then you can do things like "Instant Spellbound," which would mean it only applies to instant spells being cast. Guys how about making it not so wordy? Though the name wouldn't be Spellbound for the 2nd one I don't think it sounds right, but its in the same vein as the original concept I think. Hope this helps you out @MadManFromSpace! @sorinjace this isn't my ability lmao. Yeah @Tomigon is right about that, as I made cards using that ability. He worked me on the wording for mine back when I came up with it during a mechanix contest. 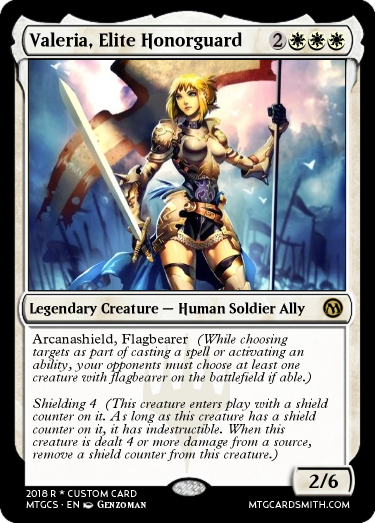 My cards with flagbearer- I decided make it an ability rather than a creature type, as soldiers have far more synergy, and the rules text had to appear on the card anyways. I can understand wanting make a more universal flavor/name than flagbearer to fit a wider variety of cards, but it definitely exists already. I feel like Hexbound is a better keyword, because the mechanic is like opposite of hexproof. I didn't make it wordy. 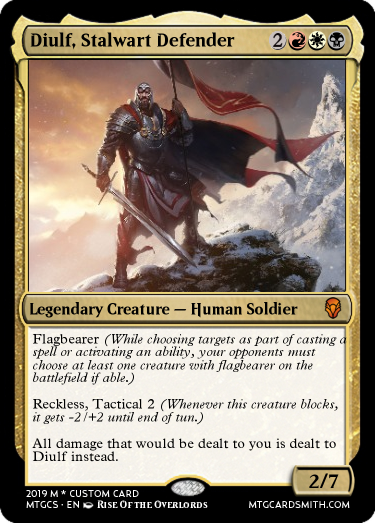 I edited the wording of flagbearers. It's made by WotC. They know rules better than us and they don't make texts unnecessarily wordy.